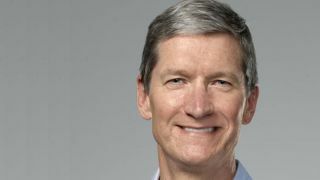 While avoiding specifics, Apple CEO Tim Cook told anxious investors today that Apple is well aware of what its competitors are up to and is exploring products beyond its current offerings. "Obviously, we're looking at new categories," Cook, as reported by CNBC, said during the company's annual investor meeting. "We don't talk about them, but we're looking at them." With rumors flying that Apple is exploring building an iWatch, perhaps Cook used his moment under investor glare to drop a wristwatch-sized hint on the room. There's also been talk for many moons that Apple is considering a foray into the TV business with its own iTV set, with a job posting seeking a software engineering manager to lead a high-priority Apple TV project popping up this month. Of course, we're speculating based on Cook's opaque comments, yet it's intriguing he chose to refer to "new categories" before the people who help keep his company afloat. Granted, Cook and Co. are in hot water with shareholders as Apple's price has slumped from a peak over $700 in mid-September to $444 as of this writing. It's something the CEO said he doesn't like either. Investors are clearly uneasy not just about the direction Apple is going but about the prevalence of Android and competitor Samsung, as one of the first questions out of the Q&A gate centered on the growth of the system and South Korean company. Cook tried to assuage concerns Apple is in danger of slipping, saying the Cupertino company has some "great products" coming. "The real market share numbers are hard to come by," he said. "It is clear that Android is on a lot of phones. It is probably true that iOS is on a lot more tablets." Success, he said, is not about making the most, though investors may feel differently about that than Cook. "We're really aware of the competition as well," he continued. "We don't have our heads stuck in the sand. There's a button or two we could press to make the most, [but] that would not be good for Apple." For those curious when Apple plans to relocate to its Steve Jobs-envisioned "spaceship" campus in Cupertino, Calif., Cook didn't shy away from answering on point. "I project that we will move in, in 2016." We've heard the projected 2016 move in timeframe before, but hey, it never hurts to repeat the info, if only to remind employees they don't need to start clearing out their desks just yet.